Interested in taking a course? Below are frequently-asked questions about executive education programs at the Boston College Center for Corporate Citizenship—on the course experience, enrollment, pricing, logistics, and more. Course location varies at various hotels around the United States. The Corporate Citizenship Management Intensive and the Leadership Academy for Corporate Citizenship Professionals are held in the Carroll School of Management Lynch Conference Center at Boston College. We also offer courses online, allowing you to work through the materials at your own pace. Participants typically dress in business casual. Please be aware that temperatures in meeting rooms can vary, so we recommend you dress in layers. The course fee varies by program; please see the individual course descriptions. Members attend all courses at a discounted rate, to confirm membership, please check our member list. The course fee includes all instruction, course materials as well as breakfast and lunch (no lunch on Friday for 2-1/2 day courses). This fee does not include hotel or travel costs. We accept online payment for course registrations. If you prefer to be invoiced, we will send you one within 48 hours of registration. (Payment is due upon receipt of the invoice.) Payment must be received before the start of the program to guarantee registration. One-day, two-day, and two-and-a-half-day courses: If you need to cancel, you must submit your request in writing to ccc@bc.edu more than 30 calendar days before the program start date to receive a full refund. Due to program demand and the volume of pre-program preparation, cancellations received 15 to 29 calendar days before the program start date are subject to a $500 administration fee ($250 for one-day programs). Requests received within 15 days of the program start date are subject to full payment of the program fee. Those that don’t attend without cancelation are responsible for the full program fee. Management Intensive, Leadership Academy, and Accelerated Certificate Summit Cancellation: If you need to cancel, you must submit your request in writing to ccc@bc.edu more than 60 calendar days before the program start date to receive a full refund. Due to program demand and the volume of pre-program preparation, cancellations received 30 to 60 calendar days before the program start date are subject to 50 percent of the program fee. Requests received within 30 days of the program start date are subject to full payment of the program fee. Those that don’t attend without cancelation are responsible for the full program fee. Online courses: If you activate a self-paced online course on the learning management site and find that it is not what you expected, you may receive course credit and elect to take another course. Requests for credit must be made in writing to ccc@bc.edu. One exchange is allowed. Programs, dates, fees, and faculty are subject to change without notice. Is there a discount for members? Members attend all courses at a discounted rate. If you are unsure of your membership status, please check our member list. What work do I need to do before I start the course? Typically, there are no pre-assignments for the courses. If a faculty member wants participants to review materials before a course, we will inform registrants in advance. How do I apply for or learn more about courses? You can register for a public enrollment program on our registration page. For questions, please contact us at ccc@bc.edu or 617.552.4545. Does the Center offer custom programs? Yes. For more information about custom programs, please contact us at ccc@bc.edu or 617.552.4545. Our Teaching Fellows and Faculty are experienced educators and/or practitioners from the field of corporate citizenship and business management. Do I have to enroll in a Certificate program to take an individual course? No, you do not have to enroll in a Certificate program. Courses can be taken at will. Can you help me determine which courses are best for me? We would be more than happy to discuss our executive education offering with you at any time. Please contact us at ccc@bc.edu or 617.552.4545. Do I have to be employed by a corporation to take an in-person course? Yes. Because our courses are explicitly designed to facilitate interaction between corporate managers with similar responsibilities and concerns, registration is open exclusively to corporate citizenship practitioners inside of companies. Nonprofits, consultants, media, and academics are not eligible to attend. Do I have to be employed by a corporation to take an online course? No. Nonprofits, consultants, media, and academics are eligible to attend online courses. Do I need to complete the requirements for the Certificate in Corporate Citizenship Practice or Sustainability Reporting within a designated time? No, you can complete your course requirements at your own pace to earn your Certificate in Corporate Citizenship Practice or Certificate in Sustainability Reporting. Courses take approximately 7 to 21 hours to complete. This includes video content and time to complete exercises. There is no time limit to complete online courses. How can I access online courses? You can access the courses from your mobile device through any mobile browser. However, mobile browsers are not officially supported. We recommend using Canvas mobile applications for an improved user experience. Additional details will be provided upon registration. How do I share my corporate citizenship certificate on LinkedIn? 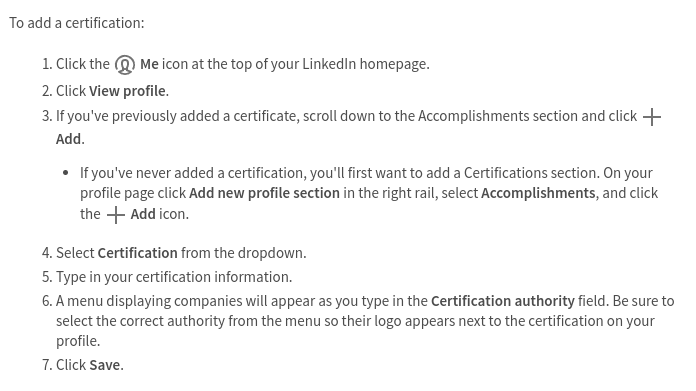 This certification does not expire: check this box! The certification you earned from the Boston College Center for Corporate Citizenship does not expire. I already know which course I want to take. Where can I register? If you already know the name and date of the course in which you would like to enroll, either in-person or online, you can register directly here. If you're unsure of the course name or date, you can find it in the Course Catalog. Can I bundle my courses into a single or multiple invoices?